Methamphetamine is an illegal drug in the same class as cocaine and other powerful street drugs. It has many nicknames: meth, crank, chalk or speed being the most common. His mist commonly use is as "club drug", and it's associated with serious side effects, like memory loss, aggression, psychotic behavior and heart and brain damage; it's high risk addiction too. Amphetamine was first made in 1887 in Germany and methamphetamine, more potent and easy to make, was developed in Japan in 1919; it went into wide use during the WWII to keep the troops awake. The japanese kamikazes use it before their suicidal missions. In 1950's, amphetamine was prescribed as a diet aid or to cure depression. In 1980, P2P (phenyl-2-propanone, a precursor for amphetamine) was placed under federal control, so was discovered that, using the ephedrine, readily available, you can obtain a drug twice as strong as the P2P-derived one, and it is not amphetamine, methamphetamine indeed. N-methyl-1-phenylpropan-2-amine's production begin with either Phenyl-2-Propanone (P2P) or with ephedrine or pseudoephedrine. The principal methods used are the Nagai method, Birch's reduction or the semplifyed shake'n'bake. It involves the red phosphorus and Hydroiodic acid. Ephedrine is iodinated by Hydroiodic acid to form iodoephedrine. In the second step red phosphorus consumes iodine to form phosphorus triiodide. The methamphetamine producted with this method is usually near 95% pure. Also known as "nazi method", consists in reacting pseudoephedrine with anhydrous ammonia and alkali metals like lithium or sodium. The reaction is allowed to stand until the ammonia is evaporated. This method is more dangerous because of the reactivity of the alkali metals and ammonia. It involves placing pseudoephedrine crushed tablets into a container with ammonium nitrate, water and a hydrofobic solvent. Then a hydrogen cloride gas is used to recover crystals for purification. The easiness of the processe make it popular in the latest years and it's notorious for causing burns. Chronic methamphetamine users show psychiatric signs, including a psychotic state and an anxiety-disorder-like state. These states are sometimes prolonged in residual symptoms, exacerbated by reuse of the drug or stress. Sometimes the prolongation of psychosis has regarded as manifestation of preexistent schizophrenia (the morbid risk beetween schizophrenia and METH users is demonstrated). With the positron emission tomography (PET), we can study the effects of methamphetamine on the human brain, paying particular attention to dopaminergic and serotoninergic systems and prefrontal cortex. Using the PET for examinate Accumbens nucleus, Caudate/Putamen and Prefrontal cortex of METH users and normal people, we can see that the dopamine transporter (DAT) density is lower in methamphetamine users than the comparison subjects, and the reduction is associated with the duration of the use. The dopamine transporter reduction may be long-lasting, even if the use of METH ceases. METH has also a reversible effetc on DAT, because it produces reactive oxygen species (ROS), that decrease dopamine transporter functions. The effect is dose-dependent and is attributable to a reduced Vmax of dopamine reuptake. Repeated administrations of high doses cause a long-term decrease in dopamine levels and in number of DATs. 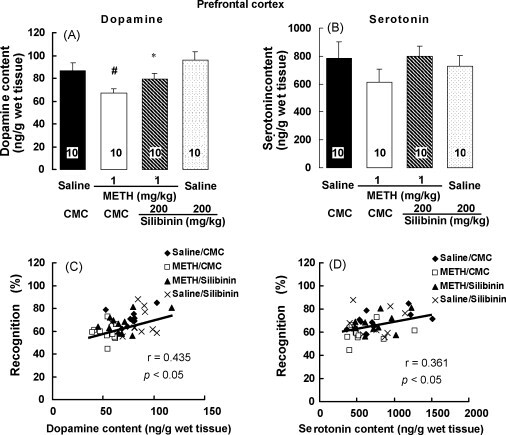 Multiple high-dose METH injections rapidly decrease serotonin transporters (SERTs) function in rat striatum and hippocampus, because methamphetamine reduces the uptake of 5HT without altering the binding of SERT ligand paroxetine. Hyperthermia contributes to this deficit, in facts a prevention of METH-induced hyperthermia attenuates this decrease. In this process the dopamine has a role, as a D1 or D2 antagonist or tyrosin hydroxylase inhibitor attenuate the METH-induce decrease in striatal SERT activity, but not in hippocampal. Unfortunately there are no approved pharmacological treatments for the METH dependence. The mainstay treatment is the psychotherapy. New targets are explored; for example, there are encouraging datas for administering dexamphetamine (D-amphetamine) and methylphenidate. Sertraline, Ondanserton, baclofen, tyrosine and inipramine were ineffective on proof-of-concept studies. With the exception of bupropion, the employing of monoamine antagonists yelded negative results in trials. Additionally, administration of glial cell line-derived neurotrophic factor (GDNF) protects dopamine neurons from toxic effects of METH in animal models. Therefore, a partial deletion of GDNF gene increases the susceptibility of mice to neurotoxicity of methamphetamine.